The IBMT made special note of Delmer Berg’s passing at their annual AGM in Dublin on Oct. 15. IBMT Chairman Richard Baxell called on me to say a few words on his behalf. Below is the text of my remarks. It was especially significant to honor the last Lincoln Brigade veteran in the presence of the president of the country, Michael D. Higgins, who delivered the keynote address. 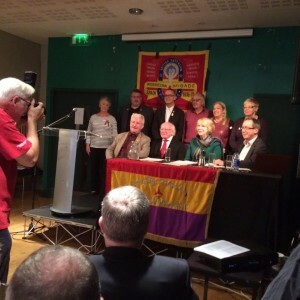 Seated: Manus O’Riordan (Ireland Sec), Michael D. Higgins – the President of Ireland, Sabina Higgins, Richard Baxell (IBMT Chair). Standing: Dolores Long (North West England Sec), Mike Arnott (Scotland Sec), Jim Jump (IBMT Sec), Manuel Moreno (IBMT Treasurer), Nancy Wallach (ALBA), Mary Greening (Wales and Membership Sec).